Kung Hei Fat Choi (gōng xǐ fā cái) is traditional Chinese New Year greeting meaning: Congratulations and best wishes for a prosperous New Year! Chinese all around the world are celebrating “Chinese New Year” today. It is the most important traditional festival for Chinese. It’s the time for family to be together whenever they are people come home to celebrate the festival with families and have the traditional “Reunion Dinner” or so-called “Chinese New Year’s Eve Dinner”. Last night, I have been invited to join a Chinese new year’s eve dinner by my boyfriend’s brother-in-law, whose a Chinese. I am honored and feel like a member of their family. 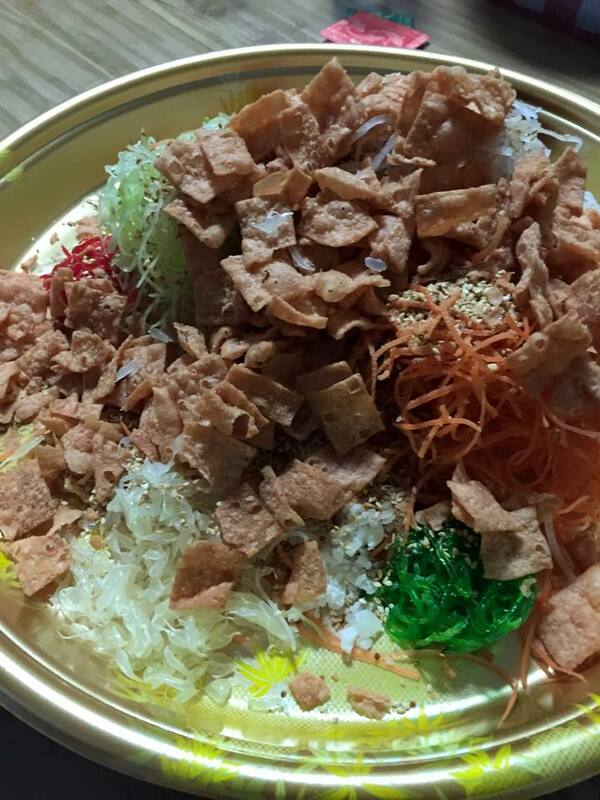 I’ve tasted a lot of delicious Chinese delicacies and I’ve got to try “Yu Sheng” a salad dish comprising thin slice of raw fish and various spices and sauces, with colorful shredded vegetables, chopped nuts, bits of pomelo, candied citrus peel and etc., mixed as we tossed the ingredients together using chopsticks while shouting good luck wishes. It is traditionally served only during Chinese New year. The Chinese culture is rich with symbolism and superstition especially when it comes to Chinese new year. One of those is the cleaning of the house to sweep away all ill-fortune and making way for incoming luck. Door and windows are decorated with red color paper-cuts or couplet which symbolizes “good fortune, happiness, wealth and longevity”. I also observed they’re giving away a pair of orange and tangerine. Chinese associating the gift of orange and tangerine as having an abundance of happiness and prosperity. I received one pair from my company. Chinese new year won’t be complete without giving & receiving “Ang Pao or Hongbao”. It is a small red paper envelop inserted with money. It is a monetary gift which is given during holidays or any special occasions like weddings that usually given out buy married couple mostly to single people. The Dragon/Lion dance show and fireworks display which are thought to bring good luck make the festival more fun & exciting. It’s a busy week in the airport. A lot of people are traveling these days as Chinese New Year is fast approaching. People travel to visit their family or loveones and some go out of the country for family gateway. 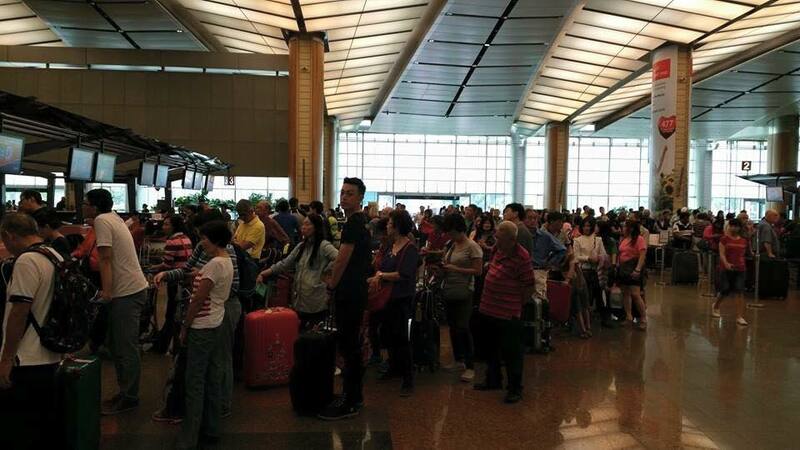 Singapore Airlines flights were fully booked that made the queue strikingly longer than usual but however we cleared the line fast enough but still some passengers became impatient and came to our counter already upset and mad. A lot of different cases we handled during check-in from visa – to excess luggage – to special assistance – to seat problem. But we managed to handle everything. Not only Singapore Airlines got a busy flights also other airlines. British Airways which is a partner of Singapore Airlines oversold one of their flights going to Christchurch that caused them to last-minute transfer few passengers on our flight using Flight interruption Manifest (FIM) or paper ticket. I handled two of them which was a couple. Check-In was about to close in few minutes time when transferred passengers came to my counter. Our flight was full. I didn’t manage to seat them together for there were only three empty and beside separate seats left on the flight. The couple released all their disappointments and anger to me. It’s their honeymoon trip and I understand their feelings and I feel sorry for them. But nothing I could do however I sent a request to the staff at the boarding gate to try to ask other passengers to swap seat to one of them so they could seat together. Airlines are authorized to overbook flight to compensate for “no shows.” Passengers are sometimes left behind. But airlines don’t wait for “no show” passenger. 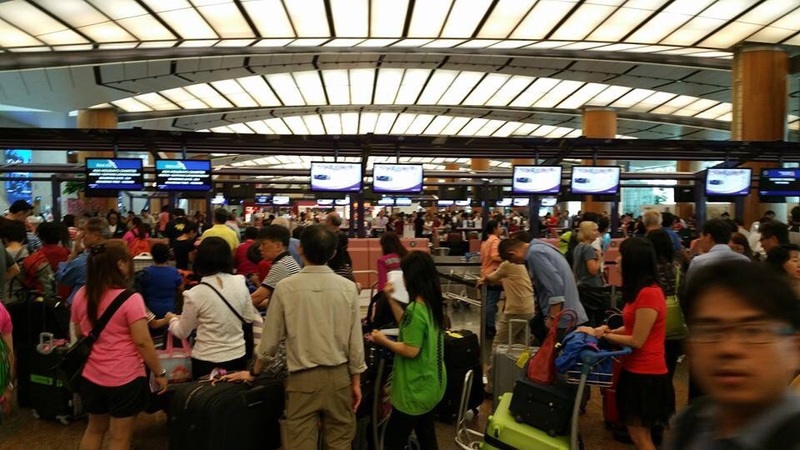 Before the flight closed they find way during check-in by seeking volunteer passengers, who are not in a hurry to give up their seat and to fly on the next available flights or to transfer to other airlines with exchange compensation. Denied Boarding Compensation (DBC) could be money, upgrade on upper class to other flights or to their next journey, travel voucher, hotel accommodation for the passengers flight transferred on the next day and etc. But let’s say the airlines cannot find volunteer or enough volunteer to exit the flight and if everybody show up, in that case, the last passengers to report will be forced, involuntarily transfer to the next available flights or to other airlines but with compensation as well. So when you are traveling and you know it’s gonna be a busy flight then secure your seat. If you are traveling with family or infant arrange your seat ahead otherwise you will be separated or you wont get a bassinet seat or your requested seat (window/aisle), check-in online and report to the counter early. Take note of your baggage allowance if you don’t want to pay excess. Remember the Airline made the overbooking and not us so please be good to the check-in staff :). Make other people’s lives Beautiful! Many people around the world celebrate “Love” today. It doesn’t have to be for Lovers. Everyone can celebrate all kinds of love. It could be the love we shared with our family or friends. But the highlight of this special occasion are the “Lovers.” Mostly couples are the one who celebrate valentines day. There are many different ways to celebrate the romanctic day just like giving valentine’s card, chocolates, flowers, gifts to their partners or admirers. Some people go out for a romantic dinner date or watch tc helicon voicelive play and some may choose the date to propose for marriage just like what my boyfriend did. Exactly one year today my boyfriend for two years and half unexpectedly and surprisingly proposed a marriage to me. It all happened in my work place. It was almost midnight when He rang me up asking me to wait for Him for he’ll gonna fetch me at work. It sound so unusual to me as it was very late at night and He just got home and tired from work but still I was clueless. I’d just thought it was just a typical date – for valentines. 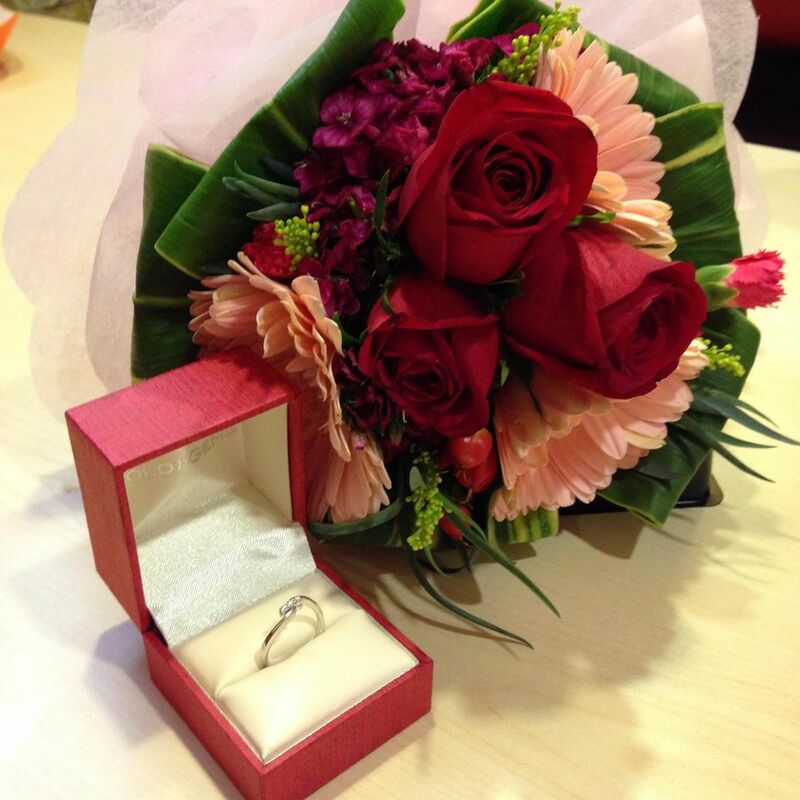 He showed up infront of my counter when I was about to finish my work and gave me a bouquet of flowers. After my shift, we went to a famous fastfood restaurant which was the only store open at that time. We ate and talked. He seemed nervous. He kept asking me questions about us which I felt weird as we don’t usually talk that much about us. I kept using my phone while he kept talking until he took my phone away before I realized He was serious. In the middle of our conversation, He just took out the “ring” on His pocket and asked me the question “WIll YOU MARRY ME?” Oh, what a beautiful gift. Tears fell down on my cheeks for happiness and so as his. He later revailed that to all He used to be girlfriends here abroad I was the only one He introduced to His family and I am lucky I get close to them. I was really surprised. I didn’t expect that He would propose to me. But anyway, I said “YES!” It wasn’t the first time I got engaged. God allowed me to experience heart breaks for my own goodness. A heart break is just a blessing and protection from God. It is just His way of letting me realized that He saved me from the wrong one. God really loves me. God is an awesome God. He heals heartbreaks and if He lets someone we really love leaves and breaks our hearts, He is preparing a place for someone else to stay in our hearts, someone from God, someone who is better in every aspects than that person who leaves. Let just have faith and trust in His masterplan for us and wait patiently. We are now one year engaged. Thanks God. We choose a long-term engagement. It’s not about needing to get married that instant as long as we know what we want, we have the same plans and common goals with our future together that what matters right now. But I can’t wait and I’m excited to the day when everything is right for us, in God’s time and in God’s will we’ll make our vows in the altar.